If one hummer is a delight, imagine have eight or nine flying around your head. These little wonders have taken up our back yard in Sault Ste Marie Ont. They will perch on feeder stands, our patio rail and in the little trees and shrubs while we work around them. It is something to behold their tail feathers when they hover just inches from your face. More than once they have followed me hovering just off my shoulder, making it important to move carefully when they are around. I am looking forward to hand feeding maybe next year. We put our Conure on the back patio and watched the hummers hover right at the cage bars. I was afraid they would try enter the cage. If you didn't put a feeder out this summer, you are missing one of God's special wonders. Join in and write your own page! It's easy to do. How? 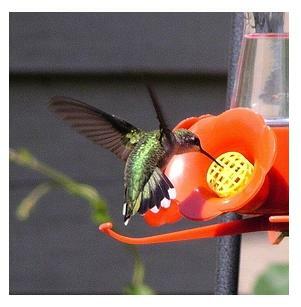 Simply click here to return to Hummingbirds.